Welcome to our monthly Independent Stampin’ Up! Demonstrators Blog Hop, in which demonstrators from around the world share their latest projects. This month’s theme is ‘Mother’s Day or Girl cards’. If you have arrived from Shirley Merker’s blog, did you enjoy her project? My card uses the beautiful Petal Promenade stamp set and matching dies. I stamped the outline of the flower in Gorgeous Grape, and the inside in Highland Heather. The leaves are in Old Olive. The ones on the oval were stamped onto vellum and then cut out with the dies. Be sure to give lots of time for the ink to dry on the vellum, otherwise the ink will smudge. The ‘happy’ is cut out using the Well Written Framelits dies and the ovals with the Stitched Shapes and Layering Ovals dies. Click on the button below to hop over to Sue Boerner’s blog and see what she has created. Enjoy the rest of the blog hop! All the supplies used can be ordered through my online store here. If you are in Australia and do not already have a Stampin’ Up! Demonstrator, I would be happy to help you with your stamping needs. Ready to enjoy the demonstrator discount? Join my team for the best benefits! Contact me for more information. As usual, I hope you enjoy our Independent Stampin’ Up! Demonstrators Blog Hop, in which fellow demonstrators from around the world share their latest impressive projects. This month’s theme is ‘Happy Birthday’. If you have arrived from Shirley Merker’s blog, I am sure that her project was inspiring, as always! The card that I have chosen this month is an eclipse frame card. I have used two different stamp sets in this card. The first is Painted Seasons, which is one of the Distinktive stamp sets, so all the shading happens in a single stamp. This is only available until the end of March as your free Sale-A-Bration item if you spend AU$180. It comes as a bundle with the Painted Seasons DSP. The images in this set are beautiful and I’ll be sorry when it is no longer available. The second set is Humming Along. This is my stamp set of choice at the moment for a birthday sentiment. To make the card, start by stamping the sentiment in the middle of the page, then stamp your flowers and leaves around it. These flowers look lovely in any colour. For this card, I used Highland Heather and Grapefruit Grove for the flowers, and Garden Green for the leaves. Next, choose a Rectangular Stitched framelit that fits around the greeting and use a larger one to make the frame to your chosen width. Stick your thin outer edge piece onto the card base, then put a foam adhesive strip along the inner and outer edges of the frame and stick it onto the card base inside the outer edge piece. Below is a picture of the products I used to make the card. Tracy Held <- You are here! I hope you are enjoying our Independent Stampin’ Up! Demonstrators Blog Hop featuring Sale-a-Bration 2019 products. Fellow demonstrators from all over the globe are participating, so we have a wide array of fun projects to share with you! You may have arrived from Shirley Merker’s blog. She always has a fabulous project to share! I found myself marvelling at the peculiarities of human nature (specifically my own, but I’m sure everyone will be able to identify.) I was looking at the beautiful Sale-A-Bration Botanical Butterflies DSP, filled with gorgeous colours, but none of them were ‘talking’ to me. So how do you get DSP in a colour that appeals to you? Well, take one of the black-and-white designs and colour it yourself. This enables you to have your DSP in whatever colour appeals to you on the day. I used the colours that match the Organdy Ribbon Combo pack, except for the green, which is Call Me Clover. Did you notice the new punch that I used on these cards? This is part of a limited edition set of products that will be available from the 1st to the 31st March. Be sure not to miss out on these. Below are the products that I used for these cards. Thanks for hopping with us each month. Now click on the next image to hop over to Sue Boerner’s blog and see the fun project she designed. Tracy Held <– You are here! I said that I was going to share some of the techniques that came back in my Circle Journal. This post is the first one. This is the card that Beryl Crisp made for my Journal. This is a lily that was growing in my garden. The darker edges inspired my to use this technique with the Lasting Lily stamp set. Below is my card. Start by inking your stamp in a light coloured ink. I used So Saffron, and then gently roll the edges of the stamp on a darker ink pad (Lovely Lipstick) and stamp. Be very aware of which ink pad you are using first. The lighter ink won’t have any effect on the dark pad, but if you get confused and roll a darkly inked stamp onto a pale colour pad, you will mess up your ink pad. Lasting Lily is one of the stamp sets that you can choose as a freeby during Sale-a-bration. If you spend $180, you can choose this set as a free item. This is the only way that you can get this set, it cannot be purchased. For the fist time (and to make things even more exciting), Stampin’ Up! is coming out with framelits that co-ordinate with the Sale-a-bration stamps. One of the sets is for the Lasting Lily (see the sample on the picture below). These will be available from the 1st – 31st March. Contact me if you would like more details about these framelits. I hope you are enjoying our Independent Stampin’ Up! Demonstrators’ Blog Hop, this month featuring Sale-A-Bration items, brought to you by fellow demonstrators from all over the world. You may have landed here from Shirley Merker’s blog. I am always looking at everyday items that will give me inspiration to make a card. It can be a colour combination on a dress in a shop window, the design on a coffee cup, or in this case, something in my garden! While it is winter in the northern hemisphere, in Australia we are enjoying the warm weather of summer. I have a bed of lilies at my front door that bloom from the beginning of December. They flower one at a time in a variety of colours, so every few days, a new beautiful flower greets me as I enter or exit my front door – it always makes me smile! One particular lily started out a creamy colour with dark pink edges when it first appeared, and then as it matured, the colour changed, ending up a lighter pink. Perfect inspiration for a card, and the Lasting Lily was the stamp set that I needed! This set has lilies, leaves and stems and a selection of useful and meaningful sentiments. These are the three cards I made that reflect the different stages of my lily. Below are the products that I used to create these cards. I hope my cards inspire you to use this stamp set. Click on the next button to see what Sue Boerner has created for us. All these supplies can be purchased through my online store. The Lasting Lily is one of the sets available through Sale-A-Bration. You can choose this as a free item if you spend $180 before shipping. 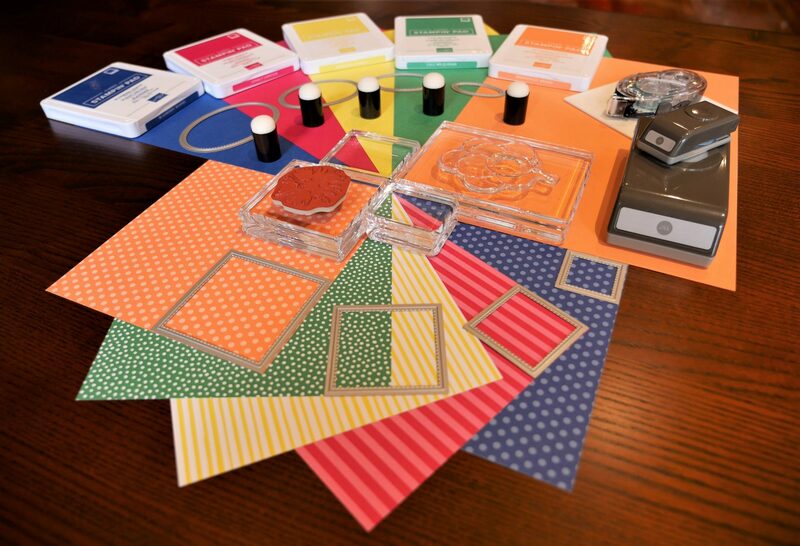 If you live in Australia and don’t have a demonstrator, I would love to help you with any Stampin’ Up! products that you would like to purchase. My lovely friend Shirley has offered to do a mini blog hop with me to help me get the technicalities correct before we do the big hop on Thursday (Hop goes live in the early hours of the morning, Australian Eastern Standard Time). We are doing a test run of linking our posts, so this hop is just two stops. These projects are easy, quick and fun, so you can spend a little time in your stamp room recreating them. This card uses the beautiful Botanical Butterfly DSP and the Organdy Ribbon Combo pack, both of which are current Sale-A-Bration items. The coloured butterflies are punched out of the DSP using the Butterfly Duet punch from the new Occasions Catalogue. It is really convenient that the punch will cut out the butterflies on the DSP instead of having to fussy cut. The sentiment is from the Butterfly Gala stamp set. Click on the button below to hop over to the USA to see what Shirley has created for us. Sale-A-Bration is the happiest time of the Stampin’ Up! year. For every $90 that you purchase, you can choose a free item from the Sale-A-Bration catalogue. If you would like to see what is inside the catalogue, click on the link above, or send me a message and I will send a paper copy to you. There is a lot of lovely stuff in the catalogue, but one of my favourite stamp sets is the Lasting Lily. There are several thoughtful sentiments in this set, and the flowers are beautiful. This is one of the Distinktive stamps, so the image stamps with lighter and darker sections, all using one stamp. I decided to try and stamp the lily in black, and I am delighted with the way that it turned out. Remember that you can’t buy this stamp set, as it is only available as a Sale-A-Bration option. If you live in Australia and don’t have a Stampin’ Up! demonstrator, I would love to help you with any products that you would like to purchase, or you can shop in my online store. I have done a few projects using this stamp set, so I will be sharing more of them with you soon. My journal has completed its circle and come home to me. (It actually arrived a few weeks ago, but with being away and then trying to get back to normal, I didn’t get around to blogging it). This was the theme for my journal. I started the journal off with the Black Ice technique. If you missed my post on how to do this, you can view it here. Below are the cards that the other ladies made according to my theme. Donna Chugg used the cracked glass method. Tash Martin chose to apply markers directly to the stamp rather than using an ink pad. Pamela Bowron made a card using triple time stamping. Rachel Pine used the emboss resist technique. Leigh Carter Shaw used the baby wipes technique. This stunning card made by Terri Kirrkie makes spectacular use of the masking technique. The final card was made by Beryl Crisp and uses the rock and roll technique. I am absolutely delighted with my journal! All the ladies did a fantastic job with making the cards! Over the next few weeks, I will give the instructions for each of these different techniques and we can all try them out. I hope you are enjoying our Independent Stampin’ Up! Demonstrators’ Blog Hop featuring gift packaging. Fellow demonstrators from all over the globe are participating, so we have a wide variety of fun projects to share with you! You may have landed here from Sue Boerner’s blog – I am sure that you enjoyed her project! As for my project, I have made a gift box that holds three Ferrero Rocher chocolates, but it also has a pouch attached that holds a small card. A few of these gift boxes are great to have on hand to give to anyone who needs a little token of appreciation, thanks, or just a boost that only chocolate can provide. I have given them to colleagues in my office and they all loved them! Click on the link below to download the instructions for this project. You can change the DSP to adapt it for any occasion. I hope you enjoy making it, and thanks for hopping with us each month. Now click on the next image to hop over to Ginger Rabesa’s blog to see what she designed. If you get lost along the blog hop, these are the links you’ll need to get back on track.